The driveway, sidewalk and patio are prepped for concrete. The soil is first staked off in the areas that will be poured, then compacted so there is a minimal chance of settling that would cause the concrete to crack. Forms are staked up around the perimeter of the driveway, sidewalk and patio to allow the concrete to be poured directly in to the correct shape. The forms are simply prices of 1x4 lumber attached to rebar stakes that are driven in the ground. The drainage system clean out pipe is also visible, as it protrudes out of the center of the driveway. Your driveway is one of the most important parts of your landscape, simply because it is one of the first things seen by anyone approaching your house. Truly, an appealing driveway whose materials are chosen properly can indeed make or break the appearance of the entire house, as well as increase its value considerably, if the owner plans to sell his or her property in the near future. A paved driveway also opens the possibility of landscaping for one's home, while also making the task of parking a tad easier. Such are the advantages of a paved driveway. However, various things should be considered when one entertains the thought of paving his or her driveway. For one, there are various materials, which can be used to pave a driveway, and each of them has its own advantages and disadvantages. Some of them can be costly, yet rewarding once the task of installing them is finally completed, while others may be cheap, and require constant maintenance. The most common material used to pave driveways is asphalt. The main reason asphalt is so common is its durability and flexibility. An asphalt surface can withstand the pressing weight of cars and other vehicles. Over time, however, an asphalt driveway may begin to change in color, as its pitch black color may begin to turn into a lighter gray. Cracks and chips may also begin to manifest after a period of time, and the need for sealing, which can be done without the aid of an expert, becomes imminent. 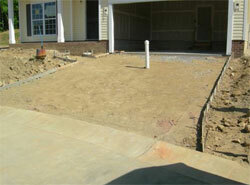 Another material that can be used to pave driveways is concrete. Concrete is a material that is very similar to asphalt in terms of their composition because they are both made of stones and sand. The only difference is that concrete is made from Portland cement, while asphalt is made from asphalt cement. A concrete driveway will cost slightly more than asphalt. This added expense comes with a benefit, as there are undoubtedly more options for design and landscaping when it comes to concrete. An asphalt driveway does not give you many options for design. As far as serving its purpose as a driveway, it is an excellent choice. If you chose concrete as your driveway material, you have some options on the design end. You can stamp the concrete into various patterns and colors. You can add decorations, such as cutting patterns into the concrete using a saw blade or using decorative stains that add color and curb appeal to one's driveway. Finally, another material that could be used to pave driveways could be interlocking pavers, which is a new way of paving one's driveway that has broken the monotony of choosing merely between asphalt and concrete materials. Pavers are perhaps the most visually appealing among all of the aforementioned types of materials, however, it is imperative that they are installed properly. Pavers consist of individual blocks of either bricks, concrete or natural stone that are laid down on one's driveway like a huge jigsaw puzzle with interlocking pieces, hence the name. There are two ways of installing these bricks, one of which is with the aid of mortar, which is placed between the blocks, making them hard to separate but also makes them prone to cracking. Another way of installing driveway pavers would be merely placing the blocks beside each other, which would make them easy to replace and maintain. The biggest drawback to pavers is the price. It can be double the price of asphalt or concrete. There are truly many ways of designing one's landscape and home. If one is concerned about the aesthetics and the overall look of their driveway that would compliment other parts of their house, then one should opt for driveway pavers. If there are budget constraints, then a practical choice would be an asphalt material. If one gives regard to practicality and aesthetics, then the concrete material would be the ideal choice. If you are looking into finishing your driveway with one of the materials listed above, it may be a good idea to have some contractors come out and show you pictures of work they have completed. Some contractors will send you to other homes to see their work for yourself. Once you have established a budget for the job and are ready to begin, you should consider the material that best suits your needs, and continue on for a great looking driveway!